(from IBD 3/26/14) Charles Schwab entered the brokerage business in the early 1960s and found it rife with hidden charges and conflicts of interest. "Adverse incentives were rampant," Schwab, 76, told IBD. "It was an industry built upon sales and the inherent commissions." He would not conform. "This gave me my early beginning," he said. "I wanted to be completely different from the rest of those firms." It's one of the nation's largest brokerages, with $2.3 trillion in client assets. The firm had 2013 sales of $5.4 billion, and its stock has been on a 150% run since 2011. Schwab himself sits on an estimated net worth of more than $6.2 billion, according to Forbes. Meanwhile, he has revolutionized an industry that could seem revolting to him for the way it treated customers. "He treats every individual with equal respect," said Stephen McLin, who has known Schwab since 1981 and is a longtime member of the company's board. "He's as polite and nice to the guy bringing the food to the conference room as he is to the president of the Federal Reserve Bank." John Kador wrote in his 2005 biography of Schwab: "In the beginning when investors were at the mercy of stockbrokers, financial self-determination ... was reserved for the well-off. 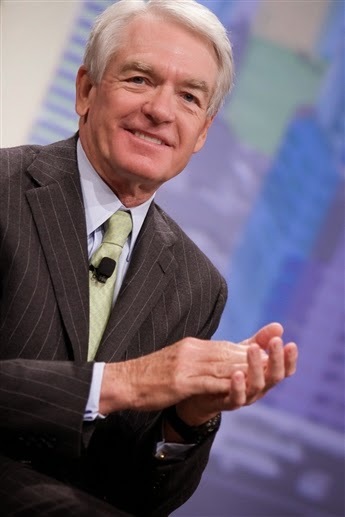 Then Charles Schwab beat Wall Street and reinvented the brokerage industry. Now Charles Schwab & Co., Inc. continues to liberate the world of personal finance and we are all, rich and poor, better off for it." In building his empire, Schwab overcame deeply entrenched financiers and investment brokers who did not appreciate his concept of offering discount brokerage service and transparent transactions to ordinary people. He contends they denied him access to financing and tried to block his business. Schwab overcame them with humility and mild-mannered perseverance, says McLin. The boss fostered a corporate culture far different than those engendered by his naysayers. "We're not going to make money trying to sneak fees or rip off some of our customers," McLin said. "You remember Goldman Sachs referring to customers as Muppets? Nobody would last long doing that around here." Schwab was born amid the Great Depression to Terrie and Lloyd Schwab. He grew up on a farm 25 miles from Sacramento, Calif.
His father was a small-town lawyer who instilled in his son the traditional values of a rural, Roman Catholic family trying to get by at that time. In the mix were honesty, respect and sweat. "Money was tight," Schwab recalled. "I learned that hard work was the only way to get ahead." As a teen and into his 20s, he worked on railways and in oilfields and drove a tractor on a sugar beet farm. He slept in a bunkhouse with mostly Mexican farmworkers who didn't speak English. He'd get up at 6 a.m. to grease the tractor. "I was paid $1 an hour, or $12 a day," he said. "They subtracted $3 a day for room and board." Schwab took an early interest in money because there was so little of it in his life. "I didn't like the lack of resources I grew up in," he said. He read books, but found reading difficult. Only when he was in his 40s would he learn why: dyslexia. Yet his passion pulled him through the pages. "I read the biographies of great men," including J.P. Morgan, he said. "I learned the most successful people in America were people who came out of finance. So I wanted to learn about that, how they did it." Schwab struggled through high school with his reading problem, but often got by on his natural charm. This strategy didn't work so well at Stanford University, so he studied subjects with more numbers than words: economics, finance and accounting. While working toward an MBA, which he landed in 1961, he spent nights and weekends as a financial analyst for an investment firm in Menlo Park, Calif. That gave him an insider's view of the industry. "What I learned about was the massive set of conflicts firms lived under in order to sell to their clients and how their profits were made," he said. "The higher the risk was for the client, the more the broker made. This was never explained to the client." For Schwab, investing helped Americans buy homes, fund businesses and pay for education, family vacation and retirement. It was not supposed to be a sales program for oversized commissions. Staying in Northern California, Schwab founded his firm in 1971 as First Commander Corp. in San Francisco, renamed it Charles Schwab in 1973 and turned it into a discount brokerage two years later. The discount brokerage benefited from regulatory changes that made possible lower commissions — to today's $8 per trade from the old days of $89. Long-standing brokerages hated the idea of a discount operation, even badmouthing Schwab's firm as a "bucket shop," he recalled. "We were breaking down the barriers. This really upset the traditional firms," he said. "We were very disliked. On one occasion I was called unethical." He persevered on one core belief: "I just had a deep sense of the value of investing as the most important way for saving and building wealth," he said. "I thought it was reasonable to expect thousands of people getting interested." Great trials awaited Schwab after he took his firm public in 1987. He endured a stock market crash that year, then the catastrophic earthquake that shook his firm's home base of San Francisco in 1989. "You've got to be eternally optimistic," he said of the leadership traits that carried him through. "You've got to come up with the most positive things that can be said about the business and what you're doing, even in the most adverse times. And you've got to believe. Only then can your team believe in you." Schwab rode a generational wave of investors who wanted to make money decisions on their own. He accommodated them with his investor-friendly innovations. In 1984 his firm had launched its Mutual Fund Marketplace with 140 funds — no-load so its clients weren't out of money on Day One. "Chuck Schwab," said Kador, "will be remembered most for making it as convenient for customers to buy mutual funds as easily as they could pluck items off the shelf at Wal-Mart (WMT) ." The firm also launched a no-fee individual retirement account, money-market mutual funds, a Schwab 1000 index fund, services for independent financial advisers, automated telephone trading and, in 1996, online trading accounts. Charles Schwab went on a 1,000% stock sprint in the next three years. True to his earliest observations about his industry, Schwab did not pay his brokers commissions. "We pay people salaries and bonuses based on the happiness of clients, not based on revenues," he said. As the needs of Main Street grew more complex, so did Schwab's offerings. The company had always attracted investors who didn't want money advice, but in 2002 it started offering guidance. • Traditional banking in 2003. • Managed investment portfolios in 2006. • Exchange traded funds with commission-free trading in 2009. • A mobile app in 2010. • A platform for active traders in 2011. • Schwab Index Advantage, bringing a large selection of index funds to 401(k) investors, in 2012. • The Schwab ETF OneSource platform, offering its customers more ETFs than anyone else in the industry, in 2013. Today, Schwab is as much a part of the fabric of Wall Street as any firm, and it aims for more growth. "Given the fact that we still have a small share of the actual market, we see huge upside," Schwab said. Schwab, who left the CEO post in 2008, likes to point out that a reputation for fair dealing carries his firm: "Most clients come from referrals from other clients. We measure that every day." As he looks back on his career, he said he hopes the key words in his legacy include "democratizing investing" and "bringing investing to millions of people." "We've helped clean up Wall Street," he said. "We've taken a lot of the mystery out of the business."